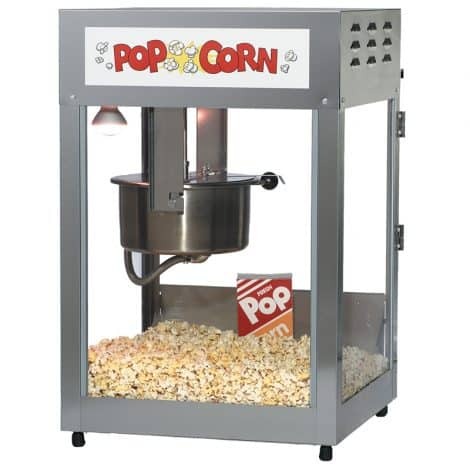 This popcorn popper is a commercial level popcorn popper with a large 12 ounce kettle. This popper is great for fund raisers, birthday party, movie nights, grand openings, and much more! We also carry all the supplies needed for this popper which are sold separately. SKU: PNA03. Categories: Party & Event, Miscellaneous Party, Concession Equipment. Tags: concession equipment, popcorn, popcorn popper. DO NOT USE ANY EXTENSION CORDS WITH THIS MACHINE!!! 20 AMP FUSE CIRCUIT MINIMUM W/ NOTHING ELSE ON IT!!! Flip “KETTLE HEAT” and “KETTLE MOTOR” switches to the “ON” position. Put ALL the oil and a PINCH of popcorn from one package into the kettle and close the kettle lid. When those kernels have popped, pour the rest of the popcorn from the package into the kettle. When the popcorn is overflowing the kettle, use the extended handle on the kettle to dump the popcorn out. For your next batch, put ALL the oil and ALL the popcorn from one package into the kettle. When the popcorn is overflowing the kettle, repeat the dumping procedure. Repeat this process until you have filled the bottom of the machine or have enough popped for your current needs. When you are done popping, make sure the “KETTLE HEAT” and “KETTLE MOTOR” switches are in the “OFF” position. NEVER LEAVE THE HEAT ON WHEN YOU ARE NOT POPPING!! TO AVOID SERIOUS BURNS, DO NOT TOUCH THE KETTLE WHEN IT IS HOT!!! MOTOR & AIR INTAKE ARE ON TOP OF THE MACHINE. DO NOT COVER AIR INTAKE HOLES WHILE MACHINE IS IN USE!!! When done popping corn, do not take apart or clean the machine. All Season’s Rent All will clean the machine once it’s been returned! Our cotton candy machines are commercial level machines meant to produce cotton candy quickly to keep all those kids happy! These are great for fund raisers, birthday parties, sweet 16’s, school functions, and more! We also carry all the supplies needed for this machine which are sold separately. DO NOT USE ANY EXTENSION CORDS WITH THIS MACHINE!!! Use a damp cloth to moisten webbing inside the floss pan. This will help the floss adhere to the webbing. Fill the head about 2/3 full with the sugar mixture. Flip the switch labeled “MOTOR & MASTER” to the “ON” position. The head will start to spin. Next, flip the switch labeled “HEAT” to the on position. Cotton candy will begin shooting out within a few seconds. Adjust the heat dial up or down to control the speed at which the cotton candy comes out. Pick up a cone holding an inch or two at the pointed end of the cone. With a light flicking action, break into the web of floss that is building up in the pan. If the floss isn’t sticking to the cone, use a damp cloth to lightly moisten the cone first. Lift up the cone with the ring off floss attached, and, by rotating the cone, wind the floss onto it. Do not roll floss onto the cone inside the pan!!! Roll it onto the cone OUTSIDE the pan only!!! When you are not making cones, turn the heat switch to the “OFF” position!!! When done making cones completely, run the machine with both switches turned “ON” until no more floss comes out of the machine. Once there is no more floss coming out of the machine, turn off the heat switch only and let the motor run for 5-10 minutes with no heat. DO NOT SUBMERSE MACHINE IN WATER!!! All Season’s Rent All will clean this machine when you return it!!! Keep all your guests cool with a soft serve machine! This machine is great for fund raisers, pool parties, office parties, neighborhood barbeques, and much more! We carry all the mixes needed for this machine available in vanilla or chocolate which are sold separately. We do require that you get the mixes for this machine from us. 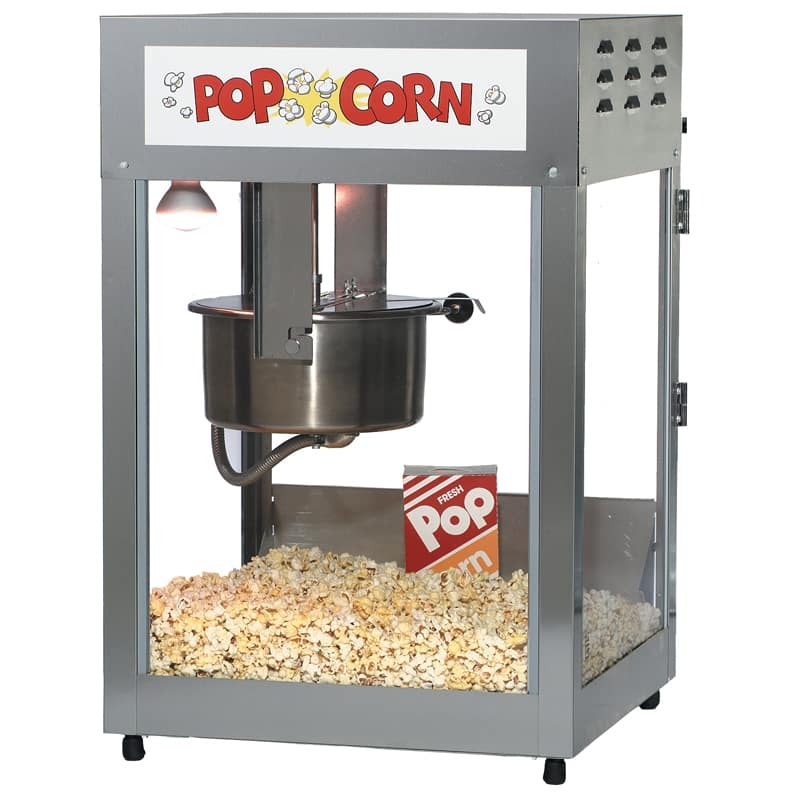 This popcorn wagon is a commercial level popcorn popper with a large 12 ounce kettle. This popper is great for fund raisers, birthday party, movie nights, grand openings, and much more! We also carry all the supplies needed for this popper which are sold separately.